If you thought that because we’re moving, and about to embark on a life-changing sailing adventure that this would be the year when we didn’t make our own maple syrup, you’d be wrong. And, it’s all my husband’s doing. In fact, every year, I think we have something more important to do than make maple syrup. And every year, he convinces me otherwise. Because this is possibly the last year we spend in our house, I thought I’d introduce some people to traditional-style maple syrup making. If you have never had maple syrup then go out and try some. Don’t miss out on one of the wonders of the natural world. Our house sits on 5 acres of property. Every year we drill holes, and install taps in our maple trees. We hang about 200 buckets. 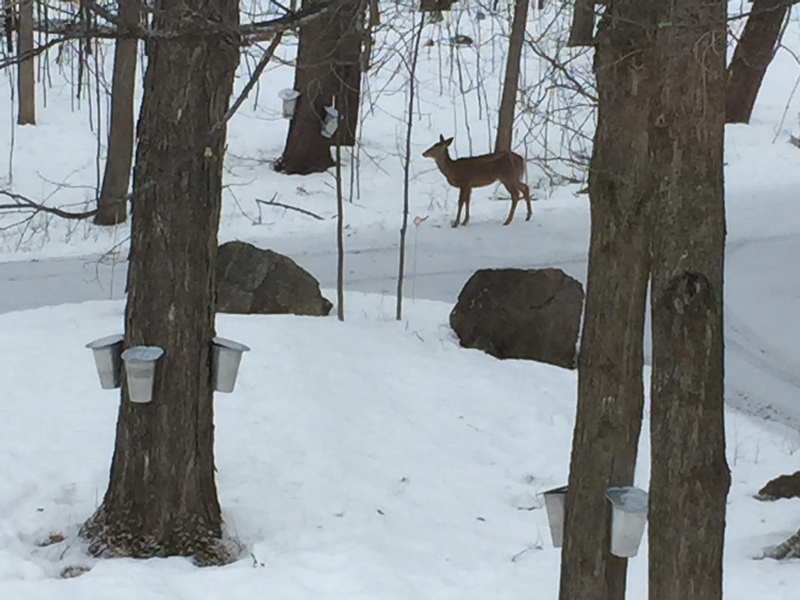 And soon, our yard becomes a winter wonderland of sparkling buckets whose lids clink and move about with the wind, as we wait for spring to arrive. When the temperature is just right – freezing at night and above freezing by day – we gather the sap by hand. Everyone in our family gets involved in the sap collection. And, on a good day, a single tree might produce a gallon of sap. 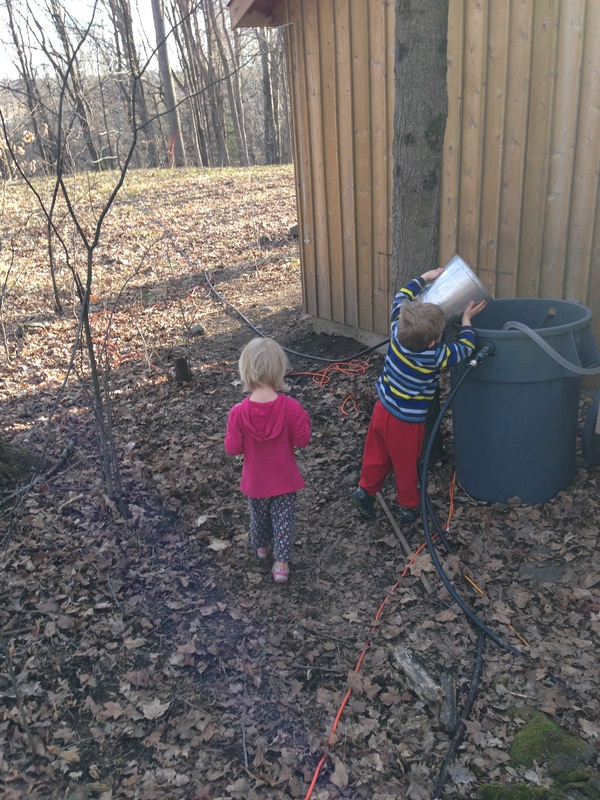 As our twins demonstrate in the picture below, we pour the sap into large collection containers, and then pump the syrup to a collection tank at the back of our sugar shack. Here is a picture of our sugar shack. Our snowshoes hang to the left in the photo, which we often need to travel across the snow with heavy buckets full of sap. Otherwise, we would fall through the snow with every step, and that would be no fun. If we were real traditionalists, we would boil our sap over an open fire, which is why we have the large grate in the picture above. The previous owner began his maple syrup operation by boiling his sap over a fire, using the grate. But, he upgraded. Below is a picture of the interior of our sugar shack. 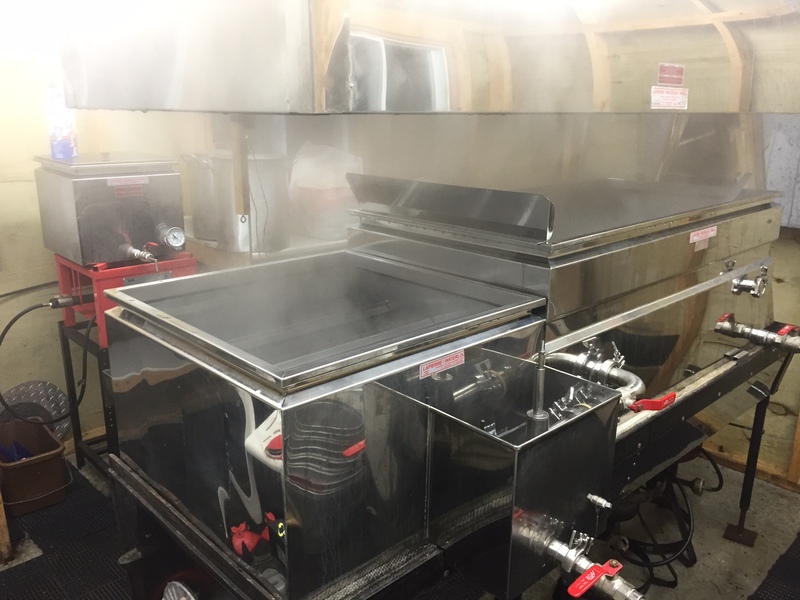 This picture shows our fuel-run evaporator (boiling machine) in action. We tend to gather the sap in the afternoon when the weather is warm and the sap is flowing. We usually boil the sap at night when it is below freezing. While we are boiling, the air in the sugar shack smells sweet, and is thick with steam. We have to open the chimney and even the ceiling to vent the room. The sap bubbles and nearly leaps out of the pan. We dress warmly. The evaporator pan has ridges inside of it, which increases the surface area for boiling, and thus speeds the boiling process. We boil the sap down at a ratio of about 40:1. So, 40 gallons of sap makes 1 gallon of maple syrup. Each year, we yield about 40 gallons of sap a year. We tend to give it away and use it ourselves. We don’t sell it. Maple syrup season is short. It ends when the temperatures rise and buds begin to form. 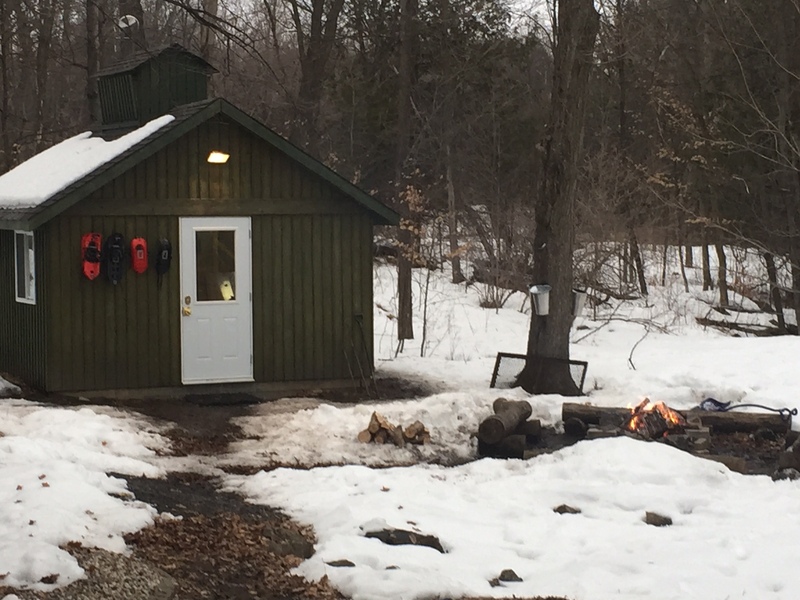 Unfortunately, this week is peak maple syrup-making season. There is no way to predict when it will occur. My husband is away in Florida with our boat. I should be studying for my RYA Day Skipper Theory course. (I write the exam next Thursday). Maple syrup is the slowest of slow food. It’s very labour intensive. But, it feels great to be outside. It’s the one time of year that we have an excuse to tromp about our yard, visit each tree, and commune with nature. We see wild turkeys, deer, squirrels and the occasional coyote. I admit that I might miss maple syrup season next year when we are sailing. A bit. But, our syrup will make pancakes taste all the more sweeter as it will provide a rich sensory reminder of what we once called home. You should save some of that syrup to trade with while cruising!